Our hearts are built on the foundation of our thoughts. The heart is molded and shaped by our thoughts. In fact, the heart is the sum total of our thoughts. Thoughts are the blueprint of the heart, and the heart becomes the image of its thoughts. 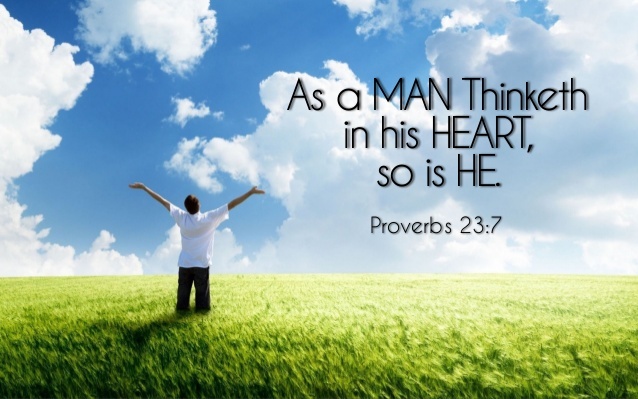 Scripture sums up this truth wonderfully in Proverbs 23:7: “For as he thinks in his heart, so is he.” We are what we think. Our thinking is daily changing the composition of our hearts as it chisels our character and behavior. However even for Christians, their thought lives are a hodgepodge of scattered confusion. The pattern of their thoughts is infused with fear, worry, impatience, and spiritual dullness. As Christians, we have become lazy and inattentive to our thoughts, which is a recipe for disaster for our hearts. We cannot ignore the importance of our thinking if we want to love God with all our hearts. As Christians, we must become masters of our thought life. We cannot let our thoughts wander aimlessly wherever they desire to go without boundary or limitation. We cannot become indifferent to what we are thinking because our thoughts are a true gauge of the spiritual condition of our hearts. Our thoughts determines how ablaze our hearts are for God and how tender our hearts are to His gentle touch. Our thoughts determine what direction our hearts will turn and what paths our hearts will follow. Tozer encourages Christians to “form the habit of a holy thought life.”[ii] God has called us to think rightly, holy, and godly. Our thinking should be a reflection of our love for God and our obedience to Christ. Our thoughts should be a testimony that we treasure God and seek His face above anything else. We cannot have passion for God if our thinking is in the garbage dump. Our thinking is to be borne from the Almighty, who is living in our hearts. It must be immersed in prayer, rooted in the Bible, inspired by the Holy Spirit, cleansed by the blood of Jesus Christ, and built upon our intimate relationship with God. Our thought life should prepare our hearts for the Lord so that He might live and reign from its throne room. Our thoughts condition our hearts to do either good or evil. King David, in his last admonishment to his son Solomon and the children of Israel, exhorts them to frame their thoughts carefully so God can prepare their hearts to love and serve Him above all else. Thine, O Jehovah, is the greatness, and the power, and the glory, and the victory, and the majesty: for all that is in the heavens and in the earth is thine; thine is the kingdom, O Jehovah, and thou art exalted as head above all. The Hebrew word translated “imagination” means to frame, form, or shape a purpose or desire. Forming an image in the mind drives the heart toward to it. Every thought in its most basic sense has an image as its foundation. This image could be a person, object, idea, or desire. The image is the fuel of each thought. When certain thoughts begin to dominate our minds, they carry their images into our hearts. The heart begins to take the form of these images. The image formed in the heart can be amazingly purifying or incredibly destructive. The heart is like a mirror, reflecting the image of its thoughts. God should be the only image that dominates our thinking. He is the pole star, the rock, and the focus of our thoughts. Our thinking provides a framework for our entire life, as it continually molds and shapes our hearts. Our transformation into the image of Christ, and our spiritual growth into a mature Christian, always passes through our thought life. Our hearts become complete and perfect in Him when God is the center of our thoughts. We must become keenly aware of what images our thoughts are bringing into our hearts. Ask yourself what image is directing my thoughts? How easy it is for this image of our thoughts to become skewed in its focus and a breeding ground for evil. The first use of this word “thoughts” in the Bible sets the pattern throughout all of Scripture, It illustrates what happens when we do not control our thinking and our thoughts are fashioned according to the wrong image. It is sobering to see what happened to the human heart because of a reckless thought life. It did not take long after sin had poured into the human race in the Garden of Eden for men’s and women’s thinking to go down the tubes. Almost immediately Adam and Eve let fear dominate their thinking when they hid from the presence of God. God was no longer the focal image of their thoughts. Corrupt thinking only worsened, as Cain murdered Abel when thoughts of jealousy and anger shaped his heart into a murderer. Sin was crouching at the door of Cain’s thought life, and he failed to master it. Each succeeding generation continued to allow sin to crowd God out of their thinking. In Genesis 6, people’s thought life had so corrupted their hearts that it reached a point of no return. Every thought, imagination, and intention of their human thinking was consistently and totally evil from morning to night. The Bible does not say some of the imaginations and thoughts of the human race were continually evil, but all of their images, desires, intentions, and inclinations, in every single thought, were evil. The Hebrew word translated “continually” means daily or at all times, which emphasizes that this was not just some weekend fling. It was their thinking from the time they got up in the morning until the time they went to bed at night. There was not a moment in the day when this evil thought process was not actively controlling their minds and shaping their hearts. Their hearts were ready to do evil at all times because they refused to think rightly according to God’s holy standard. The image that they fashioned in their thoughts was pure evil. It poisoned their hearts so that they would never repent, turn to God, and forsake their evil ways. Evil had completely consumed their hearts, and they wanted absolutely nothing to do with God in their thinking, actions, and ultimately in their hearts. This wicked and rebellious people in the time of Noah did not seek God in their thinking. God was not in one single thought. God is the most awesome, majestic, and honorable thing we can ever think about, but these people were so deceived that they did not believe they needed God. They simply had no room for God in their thinking, and this opened the door for every kind of destructive thought that eventually shaped their hearts into a monument of evil. This is the tragic height of selfishness. This is the ultimate ego trip. This is the most dangerous thinking pattern on the planet. Without God in our thoughts, we have written the death sentence to the magnificent purpose God has prepared for our lives. To never know Him is the greatest catastrophe of the ages. He deserves the honor to be first in our thinking. God cried out day after day to this generation’s rebellious hearts to forsake their unrighteous thoughts and turn their thinking to the Lord. If they had done so, He would have had mercy and abundantly pardoned. But they turned a deaf ear and cleaved unto their evil thoughts which led to their destruction. The catastrophe of the flood in the days of Noah was caused by wrong thinking. The seed and root of every single thought was evil, and it produced desires, motives, and deeds that were only evil. The fountain of their thought life became corrupt, and as its waters flowed into the heart, it poisoned every purpose, desire, and action. Our thoughts are a mighty weapon that can forge our hearts into a steel fortress for our God, or they can be a stealth bomber that penetrates our inner life and destroys our hearts. Thoughts are a much more powerful weapon than any nuclear bomb. They are the critical component to our spiritual growth. We must have a disciplined thought life that is focused like a laser on God and His Word, or our hearts will become a mush of spiritual apathy and worldly lusts. The Devil is a master general at attacking the thought life of a Christian. His war strategy involves tactics of deception, pressure, and enticement to turn our thinking away from God and toward his kingdom. The Devil knows that every action that flows out of the human heart originates from our thoughts. He knows that our moral character is an exact image of our thinking. Our thoughts determine whether our character drifts toward good or evil. The Devil knows that in order for a person to do evil, he must first think evil. He attacked Eve’s thought life in the Garden of Eden with subtle suggestions that caused her to entertain thoughts of doubt about God’s Word. When Eve followed the Devil’s way of thinking, sin poured into her nature and separated her from God. Eve’s careless thought life caused devastating consequences to the human race. The Devil continued his relentless attack on the thought life of human beings. Within ten generations he was so successful that only one person on the entire earth had godly thoughts. The population of the earth at the time of the flood was between 235 million and 7 billion people. In approximately 1,656 years after the fall in the garden, sin had spread like wildfire and contaminated every single thought of what was probably billions of people. To imagine that only one person out of this massive population had his thought life together is mind-boggling. The thoughts of every human being other than Noah had become worthless to God because they were always evil. Nothing in their thoughts reflected the image of God and not one thought brought glory to God. They were wise, rich, sophisticated, and cultured for their time, but the defining characteristic of their age was wickedness because of their thinking. A civilization that is centered on an ungodly thought life is built on sinking sand. This civilization in the days of Noah received the fruit of their thoughts, which was wickedness and corruption that multiplied on the face of the earth. This rotten thinking caused the heart to become so saturated with evil and so hardened with unbelief that nothing could alter it. Only Noah was thinking rightly and found favor with God. No one else held the image of God and His words as the standard for thoughts. No one else was guarding their thoughts. No one else cared that their thought life had nothing good in it, but was a breeding ground for evil. Only Noah had righteous thoughts that built his faith and fueled his obedience to God. Noah’s thought life was pure and free from evil because he walked with God. Is Your Thinking Breaking God’s Heart? Genesis 6:6 reveals how the toxic thinking of the human race affected God’s heart. These verses contain the first usage of the word heart in the Bible, and they describe a heart that is in deep sorrow. The toxic thought life of His precious creation, men and women, broke God’s heart. Rotherham’s Emphasized Bible in Genesis 6:6 says, “It grieved Yahweh that he had made man in the earth and he took sorrow unto his heart.” The Hebrew word translated “grieved” means to draw the breath forcibly, to groan, to sigh, and to lament. It is a heart in agony, a heart that is full of terrible pain. The Hebrew word for “sorrow” means to hurt, to be in pain, to be vexed, to be distressed and to be tortured. Words fail to describe just how hurt Almighty God was over the evil that penetrated every thought of His children whom He had lovingly created for Him. God’s heart was in horrible agony and pain as He groaned in sorrow over the condition of the heart of every member of the human race. God’s heart was crushed in pain as He cried in agony that His people refused to honor Him with even one thought. Is our thought life any better? Does our thinking bring great agony to the heart of God? How God must grieve today over the thought life of so many Christians. How it must hurt God’s heart when He sees the way we think. In this first usage of the word heart in the Bible, God is sounding out a clarion call to all who would listen that what we think is critically important to the heart of God. He knows He cannot have your heart if He does not first have your thoughts. I don’t want to break the heart of God because of my toxic thinking. I want to bring glory to God with my thinking. I want to honor Him with every thought. I do not want any virus to infect my thinking and take out the operating system of my heart. Could God have made it any clearer how concerned He is with the content and images that dominate our thoughts? A reckless thought life led to the annihilation of an entire civilization. Do you see how significant your thinking is to God? All of us are responsible before God for our thought life, but reasoning based upon thought cannot save us. The wisdom of this world proclaims that it can reason away evil and come up with a solution outside of God. Ecclesiastes 7:29 declares that men have “engaged in too much reasoning,” and 1 Corinthians 1:20-21 declares that the world in its own wisdom cannot know God for He has made foolish the wisdom of this world. Reason alone cannot get us out of our dilemma. Our thought life must be based on the revelation of God to deliver us from evil and to keep our hearts pure. Reason without the boundaries of God’s revelation leads us over a cliff just like Noah’s generation. No matter how enlightened and how intelligent we think we are, without God’s revelation we still end up in the grave right next to the fool. Scripture declares in 1 Corinthians 3:20, “The Lord knows the thoughts and reasonings of the humanly wise and recognizes how futile they are.” God knows that thoughts of human reasoning and wisdom that ignore His instruction are worthless in directing the heart in truth and righteousness. The book of Romans describes what happens to the thinking of a person and their heart when human reasoning is exalted above God. The human race has no excuse for a thought life that excludes God and exalts human reasoning. The human race has no legal defense before the throne of God. The entire creation bears witness to the awesome nature of our God and He should be occupying our thoughts. The revelation of God in His creation and revealed Word should be the food that our thoughts are feeding upon. Yet their foolish thoughts were I don’t need God! I can do this on my own. By their thinking they rejected a relationship with God as their thought life robbed them of intimacy with their loving Creator. Their thinking enslaved them to a life of hopelessness with a gnawing emptiness that clung to their souls. God says in Romans 1:21 their thinking became futile and it caused their foolish hearts to be full of darkness. The Greek word translated “futile’ means to be worthless, empty, devoid of truth, and to have no intrinsic value. They thought they were wise; they thought they had the world by its horns; they thought they were successful and had everything they needed. But they played the fool. The great exchange had taken place in their thought life. They exchanged the glory of God for an image representing the glory of mortal man and other earthly things. This was a raw deal for the human race. This futile thinking had a profound and lasting impact on the heart, causing it to be darkened and lifeless toward God. Their hearts did not reflect the image of God or His glory, not even in once crevice. The word translated “darkened” in the Greek means without insight or understanding, unintelligent and to be covered in darkness. The word was used of a heavenly body that was deprived of light. Their foolish thought life caused their hearts to be covered in darkness, with no spiritual understanding. The heart was deprived of the light of God that it needed so desperately to grow and be spiritual healthy. The thought life of the world has caused the hearts of people in every community, city, and nation to be covered in darkness. When the heart is covered in darkness, it is blind to the direction it is going. It gropes around helplessly in its search for truth. It cannot see the beauty and wonders of God all around it. It cannot live, function, and grow in the way God intended. Evil thrives in a heart covered with darkness, and many people become so used to this condition that they run from the light, refuse deliverance, cringe at truth and mock salvation. This sad state all begins with futile, worthless thinking that refuses to give honor and thanksgiving to God. [i] A.W. Tozer, True Revivals Are Born after Midnight: Spiritual Renewal Comes to Those Who Want it Badly Enough (Camp Hill: Wing Spread Publishers, 1959), Kindle Edition, 448,480. [ii] A.W. Tozer, The Price of Neglect (Camp Hill: WingSpread Publishers, 1991). [iii] John Piper, Think: The Life of the Mind and the Love of God (Wheaton: Crossway, 2010), 19. [v] Adam Clark, Commentary on the Bible, Volume 1 (Nashville: Abingdon Press, 1810). [vi] James Allen, As a Man Thinketh (New York: Tribeca Books, 1910), 10. [vii] Charles Spurgeon, Thoughts and their Fruits, Sermon 3257, published on July 6, 1911, Metropolitan Tabernacle, Newington. [viii] Skip Moen, Spiritual Restoration: Reclaiming the Foundations of God’s Word (Maitland: Xulon Press, 2008), 44. This entry was posted in Bible Teachings, Inspirational Messages and tagged as a man thinketh, battlefield, control your thinking, flood, God, heart, imagination, inspiration, Jesus, John Piper, mind, Noah, proverbs, spiritual, think rightly, thinking, thought life, thoughts, Tim Rowe, tozer, wrong thinking. Bookmark the permalink.